Standard: Children demonstrate the emerging ability to recognize risky situations and respond accordingly. The concept of “No” is used often by caregivers in the first three years. “Don’t touch,” “Stop,” “No hitting,” are all part of daily interactions with toddlers. Young children are unable to control their impulses; therefore it is important for caregivers to have realistic expectations of children when it comes to their understanding what is safe or what is unsafe. Safety in the first three years is very important, and caregivers work tirelessly to ensure that children are well taken care of and safe. 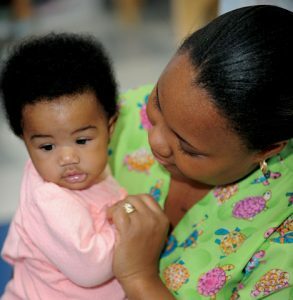 During this period, constant supervision, consistent care, and redirection are what support children in staying safe. While children are building their cognitive capacities to understand what they can and cannot do, they are not able to control their actions. Caregivers often find themselves repeating the same words and actions over and over, and while it may be frustrating, young children need those constant reminders. Children’s ability to remember is still developing, and they rely heavily on structure, routines, and consistency to build their understanding of safety and well-being. In the first few years of life, children depend on their caregivers to keep them safe and healthy for proper development. Children are beginning to grow in their capacity to recognize potentially unsafe or unhealthy situations, but will need a lot of caregiver support. Children build this capacity by establishing trust in responsive and nurturing caregivers who are consistent in meeting their needs. Children also look to their caregivers to establish what is acceptable and what is not. At birth, children are not completely defenseless. They enter the world with a set of reflexes designed to signal basic survival needs to caregivers.1 As they grow, children become aware of their own bodies and their environment. They become purposeful in how they interact with their environment and actively practice all the new skills they develop. The challenging aspect is finding the right balance of active exploration and learning, and keeping children safe in their environment. With new skills come risky behaviors that are developmentally appropriate. Children lunge forward with no regard for anything in their way, or pick up everything possible off the floor and place it in their mouths. Children do not have the ability to control their impulses, and will test safety limits that have been put in place by caregivers. Children’s growing cognitive abilities help them process why safety rules are in place, along with building memory for what is allowed and what is not. While they may pay attention to safety rules, children still need constant supervision to stay safe. Children first rely on their natural reflexes to signal basic survival needs to their caregiver(s). Toward the end of this age period, an emerging awareness in their own bodies and trust in their caregiver(s) support children in meeting needs and protecting them in uncertain and potentially unsafe situations. Children’s increasing physical abilities allow them to explore new ways of interacting with the environment around them. Motivated by these new skills, children take risks to explore and learn, and demonstrate through nonverbal and verbal communication trust in their caregiver(s) to keep them safe. Children begin to build a basic understanding of their physical limits and unsafe situations. Children are still motivated to interact and explore the environment with little regard to risks and continue to rely on caregiver(s) to help manage their impulses. Children will begin to demonstrate a limited ability to internalize what caregiver(s) communicates in relation to safety, rules, and well-being. Children continue to act upon impulses but begin to develop strategies to protect themselves in uncertain and potentially unsafe situations. Child development does not occur in isolation; children reach their developmental milestones within their social and cultural contexts. However, while “how the child develops” may look different, “what the child develops” can be observed in a more universal fashion. Below are some indicators that may warrant a discussion with the child’s healthcare provider for closer examination.